Along with blackjack and craps, video poker is one of the best bets at the casino. It requires a little bit of skill, unlike the pokies, and most games have a house edge of well under two per cent. We’ll show you how and where to play video poker online for real money, as well as which titles offer the best bang for your buck. Our top-ranked gambling websites carry numerous video poker releases, including all the most popular variants from leading software providers such as Microgaming, Net Entertainment and BetSoft. The casino sites featured here are all 100 per cent Aussie-friendly, with top-shelf SSL security protocols, multi-platform access across Windows, Mac OS and mobile devices, and a number of fast, secure online banking methods. One of the great things about video poker is the range of options available. While most roulette, craps and baccarat games are more or less the same, there are dozens upon dozens of different VP formats to choose from. The ones below can be found at most real money casinos online. 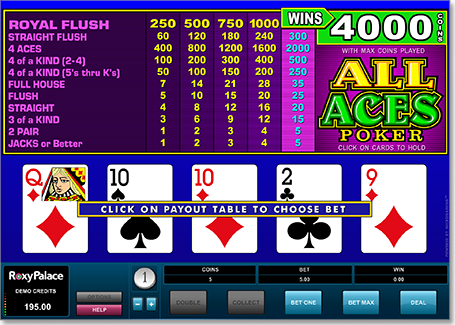 Jacks or Better – All video poker games are based on Jacks or Better rules to some degree. The name comes from the game’s defining feature: in order to qualify for a payout, you need at least a pair of Jacks. Deuces Wild – As with Jacks or Better, the key aspect of Deuces Wild Poker is right there in the name. All Twos are wilds which can substitute for any other card, thus creating more chances to draw those high-paying hands. Joker Poker – Most online video poker games are played with a standard deck of 52 cards. This one, however, adds a single Joker into the mix, which acts as a wild card. Double Joker – Whereas regular Joker Poker features only a single wild, Double Joker Poker uses two. This makes it even easier to complete hands such as a wild royal flush and a five of a kind. All American – This is one of the most popular twists on the standard Jacks or Better format. Payouts for straights, flushes and straight flushes are increased, but at the expense of a smaller return for a two pair. Bonus Poker – Heavily based on short-pay Jacks or Better games, Bonus Poker is so-called because it offers a big upgrade for hitting a four of a kind in Aces through Fours. Double Bonus Poker – Building on the standard Bonus Poker pay chart, Double Bonus offers even bigger payouts on fours of a kind. Five through Kings pay 50 for 1, Deuces through Fours pay 80, and four Aces pays 160. Double Double Bonus – As you might have guessed, this one gets you even bigger bonuses on certain fours of a kind. It comes at a cost, though, with reduced payouts on flushes and straights. Tens or Better – Very similar to regulation Jacks or Better games, except the minimum hand is lowered to a pair of 10s. The downside is reduced payouts on full houses and flushes. Aces and Faces – Not unlike Bonus Poker and its siblings, Aces and Faces video poker games offer raised payouts for fours of a kind in Aces, Kings, Queens, or Jacks. Deuces and Joker – Take Deuces Wild and Joker Poker and mash them together, and this is the result. Five wild cards makes those higher combinations easier to come by, but it also means lower payouts on most hands. As with most online casino games, video poker is a piece of cake to play. Mastering it is another story, however, as the ability to make decisions about our hand means there is a certain amount of strategy involved. Here are the basics. Choose a game that takes your fancy. We recommend starting with something simple like Jacks or Better, which is easy to follow and has a low house edge. Most games allow you to play one, two, three, four, or five coins per hand, with various coin sizes available. The vast majority of VP players always play five coins, because the max bet usually unlocks a jackpot on the royal flush. Once you’ve placed your bet, press the ‘Deal’ button to start the hand. You will receive five cards from a standard French deck of 52 (plus another one or two, if Jokers are involved). Now you can choose which cards you want to keep, and which ones you want to throw out for new ones. Tap or click the cards you wish to hold, then hit the ‘Deal’ or ‘Draw’ button. If your final hand matches any of those on the pay chart, you win a payout according to the odds listed. Some games will then give you the option to gamble those winnings, much like the so-called feature on Australian pokies machines. Guess right, you double your profit; guess wrong, you lose it all. Or, simply hit ‘Collect’ and move on to the next hand. Most video poker games offer excellent value for money compared to real money pokies and table games, but some offer that little something extra that sets them apart. Here are a few of our favourite Internet video poker games online. Microgaming All Aces Poker – While not as widely available as other variants, All Aces video poker is one of the best value bets going around. It plays a bit like Double Double Bonus, with a 400 for 1 payout on four Aces, but a simpler pay chart gives it a house edge of just 0.08 per cent – lower than any other digital casino game we’ve ever seen. NetEnt Jacks or Better Double Up – Available at our leading no download casino sites, Net Entertainment’s Double Up Jacks or Better offers a few advantages over other titles. For one, it gives you the option to play one, five, 10, or 25 hands at a time. For another, the modified pay chart improves the expected return to 99.56 per cent (about 0.02 better than standard). Microgaming Jackpot Deuces – Found under the ‘Progressives’ menu at our top-ranked Microgaming casinos, this variation of Deuces Wild comes with a progressive jackpot which is won by hitting a royal flush in Diamonds. The higher the jackpot, the lower the house edge. From around $54,000 onwards, the odds are actually in your favour (assuming you play with correct strategy).